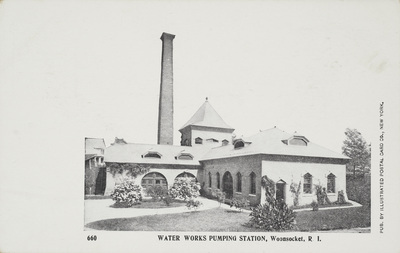 "Water Works Pumping Station, Woonsocket, R.I." by Illustrated Postal Co., New York. Water Works Pumping Station, Woonsocket, R.I. Illustrated Postal Co., New York. Illustrated Postal Co., New York., "Water Works Pumping Station, Woonsocket, R.I." (1907). Rhode Island Postcards. 308.